Hello, and welcome to SCUBA News. This month: win an awesome map of the best places to dive in the world! The free draw is exclusive to SCUBA News subscribers. We have six maps to giveaway - one enormous wall map and five smaller ones. See the article below for how to enter. Explore the diving of Vietnam with Nha Trang Fun Divers. 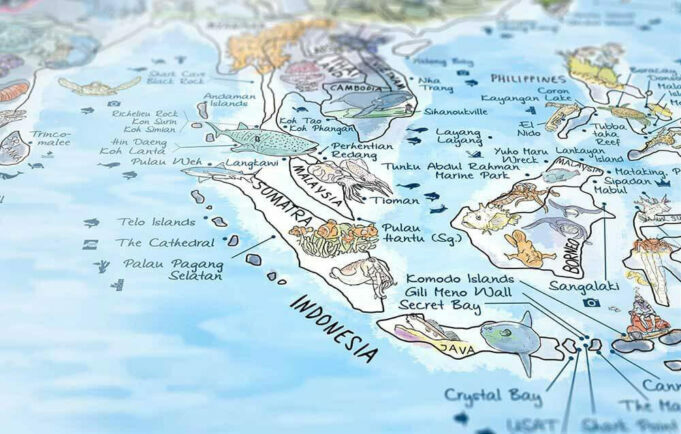 ► Win an awesome map of the best diving in the World! Kenya's reefs are protected by five marine parks and are some of the biggest in Africa. Indonesia has 6000 inhabited islands: no wonder some of them, like the Kei Islands, are only just opening up to divers. The second largest island in the Mediterranean, Sardinia is surrounded by marine caves and cliffs shearing into the sea. 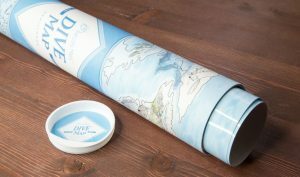 Win an awesome map of the best diving in the World! 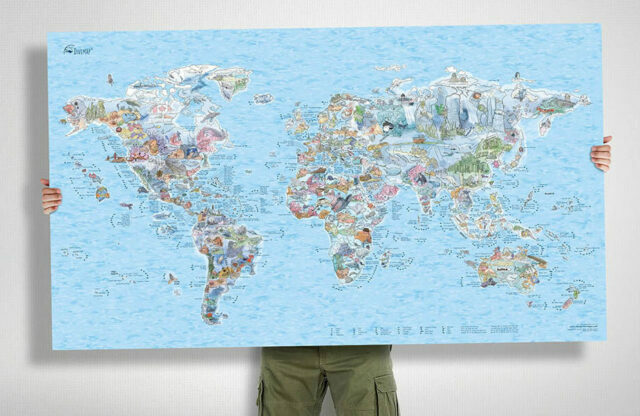 This fabulous world scuba diving map can be yours. 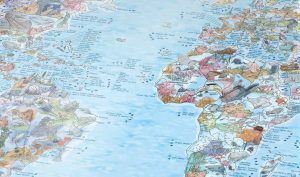 The gorgeous illustrated map shows the world's best places to dive and we have six to give away in our prize draw just for SCUBA News subscribers. Five of the maps on offer have a re-writeable whiteboard coating. Fantastic for recording where you've dived and when, or highlighting which of the world-class dives pictured you aim to do next. You also have a chance to win a museum-quality jumbo canvas print on heavy, 100% cotton cloth measuring 150 x 90 cm (59″ x 35″) worth $140. Beautiful artwork for your home. The maps show not only over 500 of the planet’s best places to dive but information about the type of dive and the underwater features. From the barracuda and shark diving in Sipadan, to Baja California via Italy’s Secca della Columbara – get excited about your next dive trip. Completely illustrated by hand, the maps are designed to spark your wanderlust and animate your inner traveller. Made old-school style – with pen and paper – all the drawings are by illustrator Lars Seiffert. The maps are lovingly produced by the Awesome Maps company. Entry is free to all SCUBA News subscribers. Just email news@scubatravel.co.uk with "World Dive Map Draw" as the subject. For more details about the maps visit Awesome Maps or our SCUBA News site. We are conducting research on disabled diving and would appreciate any disabled divers, or instructors of disabled divers, completing our questionnaire. Cressi, one of the top manufacturers of diving gear, has given us several prizes for completing the questionnaire. The primary goal of this research is to determine the influence of scuba diving on the overall quality of life of disabled divers and their instructors. The questionnaire is at https://goo.gl/forms/DsGfqe48YRq14m2F3 and is available in English, Italian, Spanish and German. I'm desperately trying to get hold of a book by Richard Field called REEF FISHES OF OMAN. I recently moved here and literally want to take up this sport having fallen in love with snorkelling in these waters . Do you know where I could get it? Good luck with learning to dive - you can get the e-book from Amazon. We interviewed Richard Field for SCUBA News, you can read the interview here. 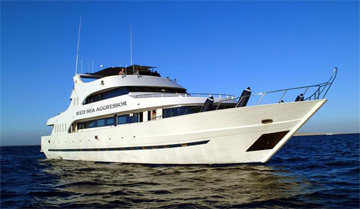 Book now for world class diving in the Red Sea with 40% off a southern liveaboard in September to December. Dive Elphinstone, the Brothers, Daedelus, St Johns. In Gansbaai, which is usually home to one of the highest concentrations of great whites in the world, the sharks seem to be acting cautiously following attacks by orcas. Cage diving operators did not encounter a single living individual the weeks after the whales started their liver feasts on some of the largest white sharks. Parts of the Great Barrier Reef and many other coral reefs around the world are already dying because of global warming. But if the fabulous ones in the northern Red Sea are protected from pollution, their unique evolutionary history means they might survive - and even thrive - late into this century despite the rising heat. The fin fanning of damselfish in the Red Sea helps boost the rate of photosynthesis of the algae that live inside corals. The megamouth shark is so rarely seen that its existence eluded us until 1976. To this day, the species is officially known from just 102 specimens. We've yet to discover where these creatures give birth, exactly where they live, or even how many of them are out there. But just recently, divers off the coast of Japan managed to free one of the lumbering giants after it swam into a fishing net. The idea is to have one clearinghouse of fish CT scan data freely available to researchers anywhere to analyze the morphology, or structure, of particular species. Too late, scallop fishermen have been banned from a Scottish loch after a rare reef was damaged by dredging. Are you a disabled diver? Do you instruct or dive with disabled divers? Fill in a survey and win diving gear from Cressi. What's going wrong in our deep blue and warming sea?